The story starts at Whole Foods: A few days ago in the checkout line at Whole Foods, when it felt like every single person in the town of Chapel Hill decided to get groceries, I had a delightful chat with the person in front of me about Alzheimer’s and Parkinson’s. I ended our talk with the comment that “Parkinson’s and Alzheimer’s are very different disorders but they do have some similarities.” Here is a brief comparison of Parkinson’s to Alzheimer’s, the top two occurring neurodegenerative diseases. Some similarities comparing Parkinson’s to Alzheimer’s: On the surface, Parkinson’s and Alzheimer’s have several important similarities. Both Parkinson’s and Alzheimer’s typically occur later in life, after the age of 50 years old (in both disorders, a subset of patients have early-age-onset). Both Parkinson’s and Alzheimer’s are central nervous system (CNS) diseases, and they both are progressive neurodegenerative disorders. What does that mean? With time, both Parkinson’s and Alzheimer’s progress as neurons die in the brains of those afflicted, and their symptoms get harder to manage. Currently, we have no cures for either Parkinson’s or Alzheimer’s. 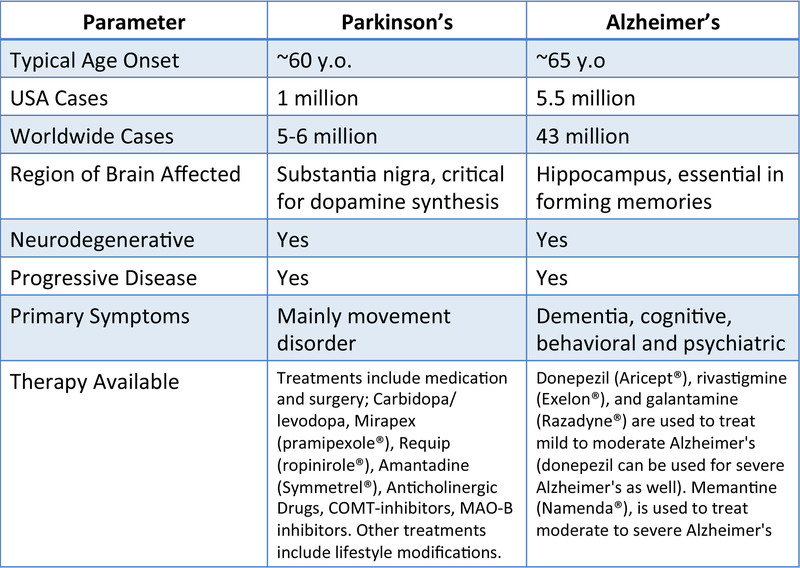 The Table (below) summarizes some of the major similarities and differences between Parkinson’s and Alzheimer’s. Clogs in the drain, I mean the brain, are somewhat similar comparing Parkinson’s to Alzheimer’s:In autopsy of brain tissue from patients with Parkinson’s, Pathologists find deposits termed Lewy bodies. Composition of Lewy bodies are denatured aggregates of the protein named alpha-synuclein. Formation of Lewy bodies will ultimately promote neuronal cell degeneration, dysfunction and death. In a somewhat similar setting, but with different proteins, aggregates also accumulate in Alzheimer’s. There are two events occurring in Alzheimer’s: the first is the extracellular insoluble deposition of a protein named beta amyloid-Aβ causing structures named “beta-amyloid plaques”; and second, the intracellular accumulation (aggregation) of a protein named tau leading to structures called “neurofibrillary tangles”. Accumulation of these ‘plaques’ and ‘tangles’ eventually lead to neuronal cell degeneration, dysfunction and death. The cause and effect of these protein aggregates in both Parkinson’s and Alzheimer’s is beyond the scope of this brief review; however, these aggregated proteins are defining disease-causing events in both disorders. The real estate mantra of “location, location, location” gives a key difference between Parkinson’s and Alzheimer’s: Parkinson’s has its beginning from the loss of dopamine-producing neurons in the substantia nigra region of the brain. 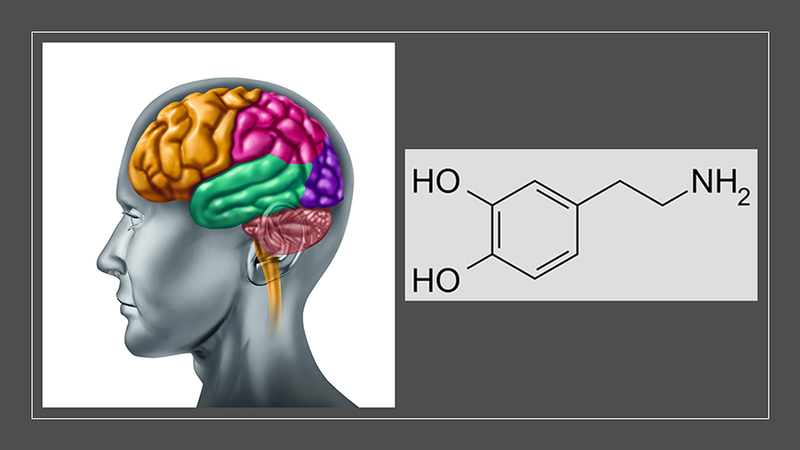 Dopamine is a neurotransmitter released by the brain that plays a number of roles in humans, including: movement, memory, pleasurable reward, behavior and cognition, attention, mood, and sleep. Parkinson’s presents mostly as a movement disorder with some leading to cognitive disorder/dementia. By contrast, Alzheimer’s has its genesis in the hippocampus, the region of the brain critical for memories and spatial navigation. And just the opposite to Parkinson’s, Alzheimer’s typically presents with cognitive/dementia issues with few leading to movement disorder. The architectural principle of “form follows function” provides another major difference between Parkinson’s and Alzheimer’s: Formation of Lewy bodies in the substantia nigra curtails dopamine synthesis. The major symptoms of Parkinson’s typically include some or all of the following: rigidity, slowness of movement, postural instability, and resting tremor. Furthermore, additional issues occurring in Parkinson’s include mild memory difficulties to dementia, swallowing problems, sleep disorders, and speech difficulties. Formation of beta-amyloid plaques and neurofibrillary tangles in the hippocampus begins the process that leads to Alzheimer’s. The symptoms of Alzheimer’s are cognitive (affect memory, language, judgment, and planning) and behavioral and psychiatric (affect the way the patient feels and acts). The most common cause of dementia (loss of cognitive function) is from Alzheimer’s. As mentioned in the Table (above), we have therapy at managing the symptoms for both Parkinson’s and Alzheimer’s. From my reading, we appear to be further along in management of Parkinson’s with a broader spectrum of therapeutic options and a better understanding/use of life-style changes in attempt to modify disease progression. Comparing Parkinson’s to Alzheimer’s is much more then comparing apples to oranges: A simple fact is that we are living longer then ever before. Therefore, disorders of the elderly, like Parkinson’s and Alzheimer’s, will continue to affect many people. Parkinson’s and Alzheimer’s remind me of the old movie scenes where someone is slowly being drawn down into a pool of quicksand; the quicksand was always insidious, powerful, relentless, and cruel. Major research efforts and advances are on-going in both Parkinson’s and Alzheimer’s. I am most hopeful that these future medical advances will be similar to the old movies where we are rescued from our own pools of quicksand named Parkinson’s and Alzheimer’s.